Where’s the Old Bill when you need ’em? Well, they’re all in bleedin’ America, aren’t they. 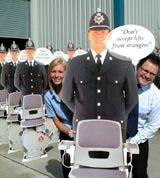 Actually, it’s 1500 cardboard cut-outs of coppers, attached to stairlifts for the elderly, which are being sold Stateside. The stairlifts, designed by Pure Design for Acorn Stairlifts, have proved a huge hit in the US, where they are providing ‘a degree of reassurance to a customer base that demands sensitivity, safety and comfort’. Good God, do they know what our bobbies are really like? If the British police force is anything to go by, the stairlift will turn up about three days after you’ve called for it.